We have made a highly-detailed 32-week reading plan based on the Take a Stand! 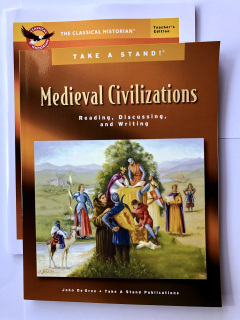 Medieval Civilizations book. Our texts we chose represent a variety of primary sources. Primary source documents are valuable because they compel the student to form his own perspective on what actually happened using eyewitness sources. The secondary source book we chose has a respectful view of Judeo-Christian culture, uses many facts and historical pieces of evidence, and is accessible to a broad range of students. The parent or teacher is encouraged to use additional texts, as well. We are currently offering this guide as a part of our Complete Curriculum. Click here for information.